Metro flyer Quebec valid August 24 - 30, 2017. Find Metro flyer, Metro Circulaire for this week, Irresistibles Smoked Coho Salmon Sale Price $9.99 300 g. Lean Ground Beef Sale Price $3.49/lb $7.69/kg. Economic pack. Flamingo Chicken Wings Sale Price $6.99 760-800 g, 600-650 g.
Irresistibles Naturalia Peanut Butter Sale Price $1.99 500 g.
Stouffer's Dinner Sale Price 2/$4.00 212-340 g.
The Laughing Cow, Kiri, Party Cubes, Babybel Cheese, Kraft Singles Le Petit Cremeux Process Cheese Food Sale Price $2.99 120-144 g. Kraft singles 16-24, le petit cremeux 450 g, process cheese food 400 g.
Yoplait Yop Drinkable Yogurt Sale Price $0.67 200 ml. Yoplait Creamy, Source 0% Yogurt Sale Price $3.99 16/90-100 g.
Raspberries - Prix 3/$6.00 120 g,170 g.
Large Broccoli - Prix $0.99 Gr 14. Green Yellow Zucchini Squashes, Wax Or Green Beans Or Field Red Or Hot House Tomatoes $1.49/lb - Prix $3.28/kg. Bonus 10 pts. Gr 39-44.9/lb - Prix $3.95/kg. Green Yellow Zucchini Squashes, Wax Or Green Beans Or Field Red Or Hot House Tomatoes $1.49/lb - Prix $3.28/kg. Bonus 10 pts. Gr 39-44. Artichokes - Prix Bonus $3.99 20 pts. Romaine Hearts - Prix $2.99 3 un. 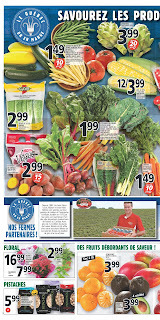 Top Beets, Rainbow, Red, Green Swiss Chard, Kale, Dandelions, Nantes Carrots - Prix $1.99 454 g.
Yellow Or Chioggia Beets - Prix $2.99 2 lb. Bonus 15 pts. Top Carrots - Prix $1.49 Bonus 10 pts. Metro flyer quebec Canada : Trend Exclusive Bouquet - Prix $16.99. Ivy - Prix $2.99 Assorted. Pot 4". Kalanchoe - Prix $7.99 Pot 6". Pistaches Wonderful Pistachios - Prix $5.99 200-255 g. Clementines - Prix $3.99 2 lb. Avocados - Prix $3.99 4 un. Retrouvez ici le dernier dépliant Metro et les meilleures offres et coupons des épiceries au Québec.